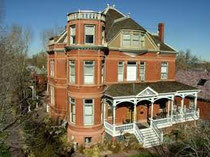 Denver's premier wedding mansion was in fact built by a "Lumber Baron" - John Mouat in 1890. The fortune he amassed is on display today as the Lumber Baron Inn & Gardens restored with your wedding needs in mind. Your exclusive rental either afternoon (11:30am to 4:00pm) or evening (6:30pm to 11:00pm) in their award-winning Victorian setting will ensure lasting memories, on a budget.